I would like to thank ALL the Breeders of these dogs, as well as ALL the owners for their accomplishments and allowing me to use thier pictures on my website to brag about them. I would like to extend a special Thank You to HOOFPRINT FARMS and LYNSDENS KENNEL. 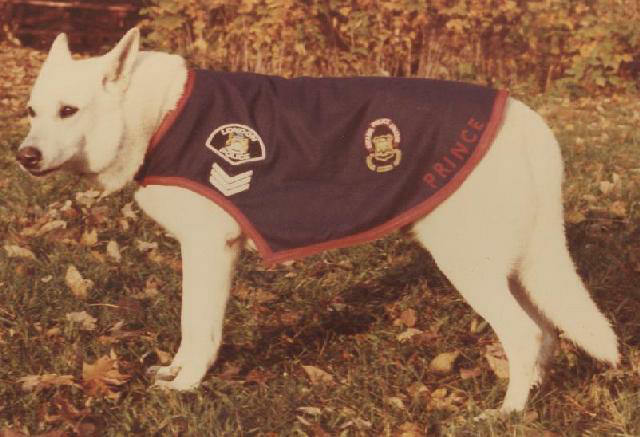 Prince was 11 months old when he was tested for his ability to be a police dog. At first they were very disappointed that Prince was white and they weren't going to accept him. They decided that since he had been offered to them, they should at least test him. Well he made such a good impression that they accepted him to be included in the first group of 4 dogs to be trained for the London Ontario Police Force. He passed with flying colors. He was the lifetime partner of Rick Frackrell. He was also given Sargent bars, when Rick was promoted to Sargent. He was pictured many time in the newspapers, when he had helped solve another crime. He was credited with over 200 arrests and he was still working at the time of his death due to liver failure at 11 years of age. Pacer was sold to Gunner Johannessen in Denmark. 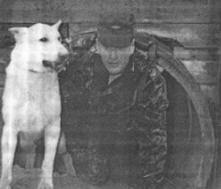 At the age of 8 years Pacer was teamed up with the Danish Military and Lance Corporal Michael Johansen at the age of 9 Pacer and Michael Johansen teamed up with fellow officer Sergeant Anders Borg and his German Shepherd Bruno, to competed with 100 other military competitors from Seven Countries, to win the World Championship for "International Canine Biathlon". Included in this unit competition was teams from England, USA, France, Belgium, Norway, and other Danish places of work, including the Danish policemen. The USA and England compete with at least 20 men and dogs. The competition is very demanding . They have to run 6 kilometers and face 20 obstacles, since the competition is for military and police only, shooting with a submachine gun is also included , in the end the dogs have to catch a "criminal" and make sure he does not escape. These are 4 brothers that all graduated as leader dogs for the blind from the Canine Vision Canada. Three were littermate's and the forth was from a repeat breeding. Bear was used for demonstrations at the lions club center for a while. All were successfully matched up with their blind masters. 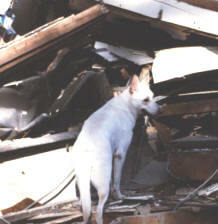 Siri was purchased to follow in the footsteps of Panda, Beth's first Search and Rescue dog. These would be big steps to fill. Sirius tried really hard, he not only became a Search and Rescue dog he also became a Cadaver Dog, Unfortunatly Siri had to be retired early because of a injury to a hind leg, and then bad injury to a front leg. He later was certified as a Pet Therapy Dog. 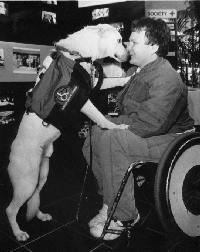 Quasar is specially trained to assist Peter Zein a quadriplegic, in his every day living. He'll pick up any thing Peter drops, and will go and fetch him things on command. He is also trained to pull the wheel chair if Peter gets tired. Quasar goes to work with Peter everyday, and has made his life much easier. Peter says Quasar replaced my legs and my arms. The breeding between Pancho and Seika was repeated just to get another pup for Beth. 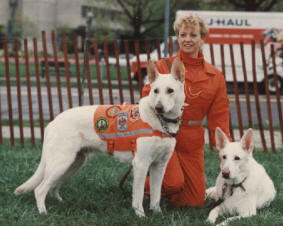 Czar was to take his brothers place with the Search and Rescue work with Beth. He was a bundle of energy and Beth started him in cadaver work, and this is where Czar still excelles. 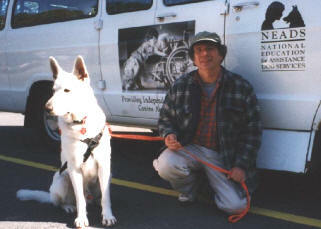 He has been a top cadaver dog for quite a few years now, with many finds to his credit. He also settled down enough to become a Search and Rescue Dog. One of Czars more notable finds was during the Oklahoma Bombing disaster, where he helped find bodies. 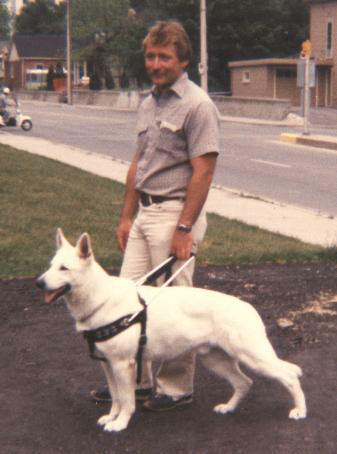 Oavae was specially trained as a hearing dog for Vincent. He was also Vincent's friend, they did lots of things together. Vincent entered him in the herding instinct trails, and they even got involved in the costume class. 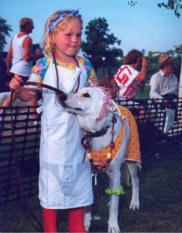 White Dream was sold to Claudia Grandy in Germany for breeding purposes, she was missing a tooth and couldn't be bred. She was then trained to be a seeing eye dog. 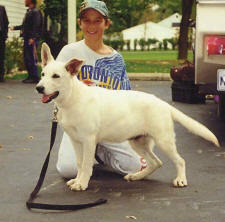 Breeder: Joanne Chanyi - Handler: Sly Acosta with the Buffalo Police Dept. Harley is a trained drug detection dog. He has just recently graduated. We hope to hear of some of his accomplishments in the future. Suzy is a specially trained Hearing Dog, a job which she does well, she also is credited with helping save Linda. One day Linda began to have a seizer, and Suzy ran for Linda's husband and INSISTED that he follow her back to Linda. She was only 6 months old at that time. in the fall of 1998. 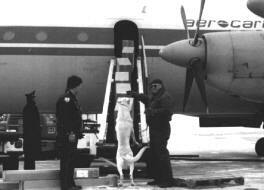 Niko was trained to search airplanes and other places for illegal substances. Wyatt has graduated as a Hearing Dog from NEADS. He accomplised this in just one month of training. 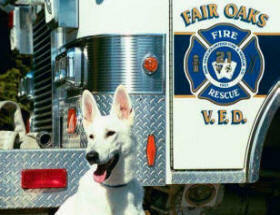 Thor has passed his tests to become a Search and Rescue Dog with the Fair Oaks Volunteer Fire and Rescue Company. Thor has had a few good finds to his credit and when the Terrorist crashed a plane into the Pentagon, Thor and Blair was asked to help out. They successfully worked at that site for several days. Jadzia is pictured here finishing her WSCC Altered Championship. She is a very smart and independent girl. She is a certified Cadaver dog and should be a SAR Dog also, but her love of her freedom and desire to explore has held her back. She is Beths personal protection dog. She is to be a Therapy Dog and will pursue that work as soon as time allows. Fearghas passed the test to become a Cadaver Dog when he was just 14 months old. When the Terrorist attacked the USA and crashed a plane into the Pentagon. Beth and Fearghas was called to help in the search. Fearghas was not quite 2 years old, yet they successfully worked very well at the site for several days. When people hear of Therapy Dogs, they often think of dogs that visit nursing homes and hospitals. There are also other realms of the therapy dog world that get overlooked. There are dogs that visit libraries, elementary schools, and even prison. Yes, that’s right, prison. Magnum and I visit the Wackenhut, Michigan Youth Correctional Facility. It is a level five maximum-security prison for boys - the only facility of its kind in Michigan. There was an announcement in the local paper, it stated that there would be a meeting and a presentation for anyone interested in joining a therapy dog group. So, I went. 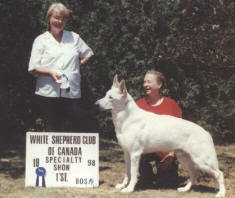 I’ve always wanted to be able to do something locally with my white shepherds. The presentation was done in a professional manner. It explained that Therapy Dogs International, Inc. was a national organization that certifies dogs that complete a standard obedience/temperament test. The local group is called Pawfect Companions. 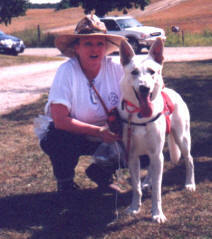 Cynthia Glazier started the club in the Big Rapids, MI area. The interest in the organization was large enough that Cynthia decided to hold two different training classes to prepare for the testing. Each class met every Friday or Sunday for about an hour learning the basic requirements needed in order to pass the test. Pawfect Companions was founded in 1994 when Cynthia and her dog Mandy were certified as a Therapy Dog team, the first in our area. As Cynthia and her dog visited several area nursing homes, the local hospital and area schools, interest in the group began to grow and now in 2004, consists of more than 30 certified therapy dog teams. The group was incorporated in 2003 and received nonprofit status in 2004. Members of Pawfect Companions are required to be certified through Therapy Dogs International, Inc. TDI - based in New Jersey - was founded in the mid 70s; there are now more than 8,000 certified therapy dogs in the U.S., Canada and in Europe. To learn more about TDI, visit www.tdi-dog.org. or call (973) 252-9800. Therapy Dog certification is not a complicated process. Basically, in order to become a certified Therapy Dog, your dog must pass the American Kennel Club Canine Good Citizen test, with a few modifications, including food refusal (which is easier to train than it sounds) and reaction to medical equipment. Magnum passed the test with flying colors - although if he had to refuse a tennis ball instead of food, there might have been a problem! When there’s a tennis ball around not much of anything can distract him. It only took one visit for Magnum to actually love visiting the prison. We attend the Correctional facility as a small group, which usually consists of about 4 dog/handler teams. We enter through the front doors and a lot of faces light up. "Look at the dogs", "how sweet", "here to play again", are just some of the compliments our group gets when we visit. We go through a security check and a metal detector. Now it’s time to hang on tight cause we are in. Magnum knows exactly where to go. I have to hang on to the leash with both hands to keep him from pulling me down the hall. The inmates are ready and waiting in a general visiting room along with at least one corrections officer and a social worker. We then take the dogs out in the courtyard for them to play. The boys throw the ball as far at they can over and over again until Magnum lays down with his tongue on the ground, which is generally at the end of the one hour visit. The weather does have some effect on our visits. The majority of the time, we dress according to the weather. There have been a couple of times that we cancelled the visit due to extreme weather conditions. When the weather doesn’t permit us to play outside, we visit inside the general visiting area. The program has been going strong since about September 2003. The inmates are required to remain on good behavior throughout the week if they are to continue visiting the dogs. We have 2 inmates that have remained with the program since its beginning. Visiting the correctional facility remains a trial program for both the correctional facility and the Pawfect Companions Club. It feels good to be able to put a smile on someone’s face each week when we visit. Not many people are willing to attend what seems to be like, such a "bad" place. Magnum and I have never felt threatened or endangered in any way during our visits. 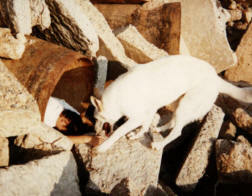 It continues to be a joy knowing that my white shepherd can be an inspiration for others who often have had nothing to look forward to in life. I encourage you to try taking the Therapy Dog International, Inc. test. You’ll receive a Canine Good Citizen Certificate from AKC. Even more rewarding than a certificate, you will fill someone’s heart with the unconditional everlasting love a white shepherd has to share.